In the world of heat sealing, and imported/knock-off units, you get what you pay for. AIE ensures high quality sealers for your application. Below is a list of different sealers for sealing bags. AIE offers a 90 Day limited warranty through the factory. Wires and teflon are considered wearable items. 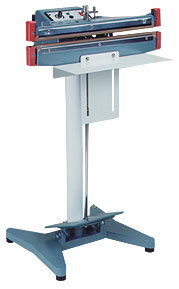 Arm Sealers - Basic table top one armed impulse sealers for bags. Basic sealers and additional models with cutters or models with controlled congealing cycles. Automatic Sealers - Counter top production bag sealers. Foot switch operated or automatic cycle. Best units for placing the units at the most productive height for your operators. Bag Maker - Make bags from poly tube stock fast and easy! Great low cost method for creating custom sized bags. Band Sealers - High speed applications for sealing bags. Sealing a lot of poly bags? This is a continuous sealing method. Seals as fast as you can put them in. Clam Shell Hand Sealer - Spot seals clam shells. Clam Shell Sealer - Ultrasonic unit for faster sealing. We recommend testing prior to purchase. Foot Sealers - Stand alone Constant Heat models. For speedier applications. Double Foot Sealers - Impulse Sealers with top and bottom sealing heads for thicker and hard to seal bags. Hand Double Sealers - Applications involving heavy duty type bags up to 20 mil thick. Hand Held Sealer - 6" unit for sealing poly bags. Two different models. Hand Wrapper - Used in meat packing environments to seal meat packages. Hand Sealer - "2 Hand" - Keep both hands on the bag during the sealing operation! Wall mountable if you are filling bags with liquids. 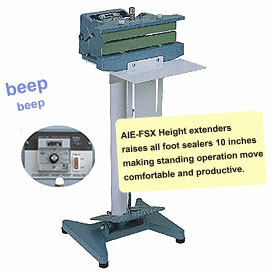 Economical impulse sealer that works by depressing the shelf to activate sealing motion. Hand Sealer with Magnet - Similar to the Arm sealers but with the added magnet to remove guess work. I-Bar Shrink Wrap Systems - I-Bar systems for shrink wrapping packages. L-Bar Shrink Wrap Systems - L-Bar systems for shrink wrapping packages that seals the two sides at the same time to speed up the operation. Shrink Tunnels - Used in conjunction with the I-Bar and L-Bar sealers for faster shrinking of film. Vacuum Sealer - Economy vacuum sealer.